Black Gate » Articles » Read Black Gate in Italian! Read Black Gate in Italian! 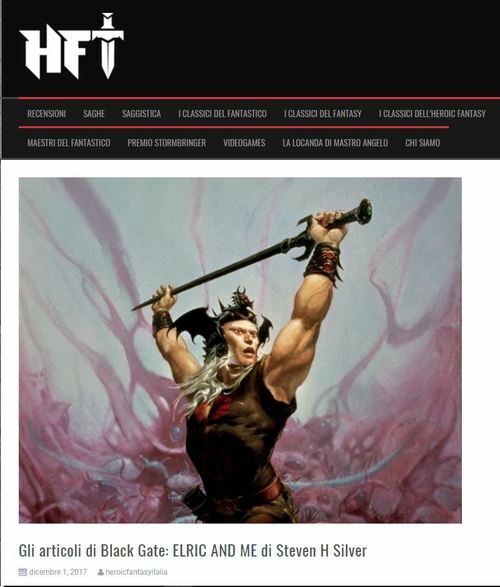 Black Gate has partnered with Heroic Fantasy Italia (HFT) to translate and post some of our most popular articles in Italian. Here’s Editor Alessandro Iascy, from his original e-mail. I’m Alessandro Iascy and I am the publisher and editor of the Heroic Fantasy Italia portal, heroicfantasyitalia.altervista.org. I’m contacting you because I always read Black Gate with great pleasure and I would like to start a sort of joint venture with you. Heroic Fantasy Italia is the most important heroic fantasy divulgation portal in Italy, and I would like to be authorized to translate and publish some of your articles on our pages… I am writing to you on my friend Mark Lawrence’s suggestion. Alessandro and his team did top-notch work reformatting and presenting Steven’s article; check it out here. Thanks to Alessandro, we look forward to offering more BG articles to our Italian readers. We have regular Italian readers? Oh boy, I feel a bit awkward about my posts about sword-and-sandal films. Well, I don’t know how REGULAR they are… but we definitely have at least a few!